In order to provide your country’s consumers with the goods they wish, you need to import some of them and to pay foreign producers for the goods and for their transportation. The required money can be obtained by exporting your own goods and services. Roman individuals could export Roman goods as a return cargo when sailing back to foreign countries. The Roman state could provide the ‘service’ of military protection of provinces within the empire, receiving a tribute for this service. Trust between buyers and sellers is required, hence regular trading contacts are necessary, and therefore repetition of trade routes. To be ‘professional’ you need to specialise: choose your goods, choose your trade cities and routes, choose your trade contacts. That will be ‘your’ trade network. The nodes of each network may be large inter-regional ports (‘hubs’) or smaller regional, or even local, ports. According to Wikipedia, a hub is the central part of a wheel that connects the axle to the wheel itself. Many expressions use the term for a literal or figurative central structure connecting to a periphery. A transport hub is a place where cargo is exchanged between transport modes. With the growth of containerisation, intermodal freight transport has become more efficient. other raw materials such as coal and iron ore are also transported in bulk from Africa, Australia and South America to many countries. The major nodal points, now called “hubs”, are therefore located in Europe (Rotterdam, Hamburg), in USA (Los Angeles, San Francisco, New York, New Orleans), in Asia, (Shanghai, Hong Kong, Busan, Yokahama, Singapore). Goods were exported to Rome and other cities of the empire: not only exotic spices and goods from beyond the Red Sea, but also vast quantities of grain produced in Egypt. Alexandria was a hub of the Roman economy. Additional nodes of a large-mesh Roman trade network might be located at Gades (Baetica, for garum, salted fish, olive oil) and at Carthago (Proconsular Africa, for wheat and olive oil). This coarse network shows 3 lines converging on Rome. The question is whether finer-mesh networks might be added to the coarse one by including nodal points of smaller importance. Ancient ports mentioned explicitly by at least one ancient author. A corpus of 75 ancient authors from 500 BC to 500 AD (with a few exceptions like Homer, Procopius) has been analysed, searching for the word ‘port’ in the 19th c. French translations available on the web (mainly www.remacle.org). Each author is counted only once for each port, even if he mentioned the port several times in several books or chapters. Obviously, various reasons motivated ancient authors to mention these ports: historical (military, naval), commercial (trade, emporia), geographical (description of land and peoples) or sailors following the coasts. In the picture above, trips like those of Arrian on the Black Sea or the Stadiasmus can nearly be distinguished. Furthermore, ancient authors may sometimes have been somewhat egocentric when describing only their own part of the world, like Pausanias in Greece, which may have led to ‘zooming’ effects in some areas. Conversely, some areas were not much mentioned by ancient authors, like Hispania, Lusitania, Gaul and it cannot be said if that is because there were no ports (which is surely untrue) or because these somewhat remote areas were of lesser interest to ancient Greek and Roman authors. Anyway, a concentration of ports mentioned by ancient authors can be seen around the Aegean Sea. 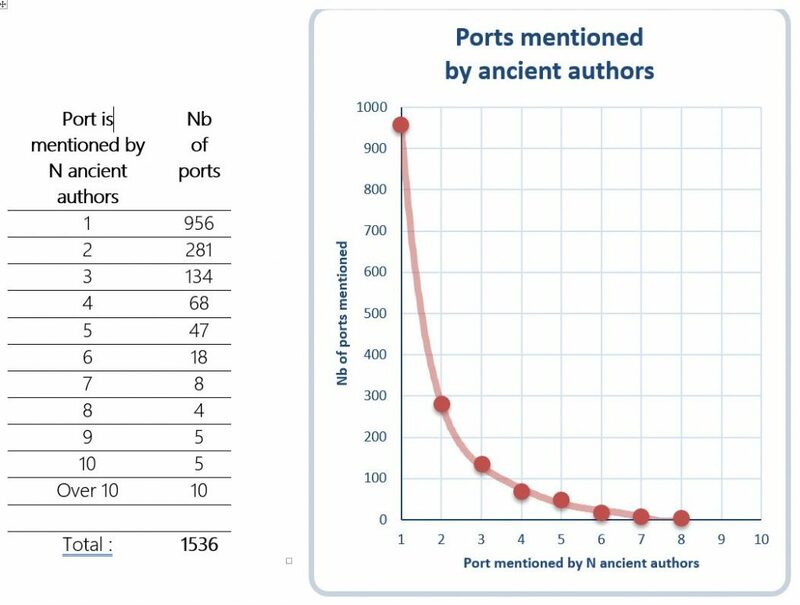 Nearly 1000 ports are mentioned by only one ancient author. Nearly 300 are mentioned by two ancient authors. Detailed results of the database analysis. The listed places are shown on the map below (green dots) together with the four ‘main hubs’ (black dots). The listed places are fairly concentrated in an area between Rome and Rhodes covering the southern part of Italy, Greece, the Aegean Sea and Asia Minor. It cannot be denied that this area was the most active area both for trade and for naval operations during a millennium from the 5th c. BC to the 5th c. AD. Note that no time frame was defined, hence Greek hubs of the 5th c. BC are mixed with imperial Roman hubs. Had we restricted the time frame to e.g. the 6th to 4th c. BC, we would have seen Piraeus (over 10), Emporion (Spain) (4), and Naucratis (Egypt) (1) as main hubs. Had we taken the 3rd and 2nd c. BC, we would have mentioned Delos (10). 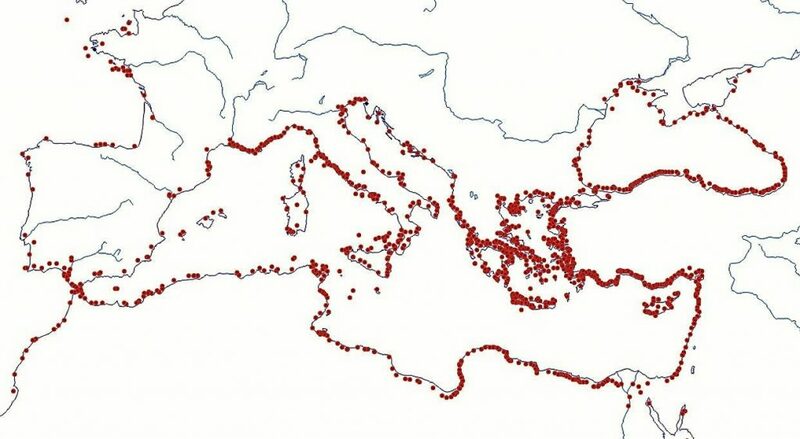 Trade networks in the Roman Mediterranean Sea: Black dots are main hubs: Rome, Alexandria, Carthage, Gades; Green dots are places mentioned by five or more ancient authors. It must be admitted that the above approach based on the number of ancient authors mentioning places does not show the trade networks we would expect intuitively because major cities are missing (Tarraco, Narbo, places on the Adriatic, on the Black Sea, in northern Africa). How can we further study these networks? We may look into shipping, we may distinguish different historical periods, we may search ancient texts … we may study commodities, i.e. try to find out from where they come and where they go (mostly to Rome!). tin (cassiterite) Cornwall (Ictis), France (Ploermel), Spain (Laza), Germany (Erzgebirge), Tuscany (Mte Rombolo & Valerio), Dalmatia (Mt Cer), Turkey (Uludag near Bursa, Bakla Tepe NW of Ephesos, Mersin area: Kestel/Göltepe mines)? Syria (from NW Iran & Afghanistan/Bactria)? defrutum, siraion, epsima (reduced fruit must) Baetica, Cyprus? These tables are probably incomplete. Please help! Similar studies can be conducted for other cultures: Greeks, Phoenicians, Egyptians, Mycenaeans, Minoans, etc. Results are provided in the xls table. Realise that this result includes only primary imports, i.e. goods needed by the peoples for their own consumption, but does not take into account imports aimed at being re-exported, possibly after some manufacturing. Hence, this is only a first step towards a better understanding of ancient trade networks. Trade networks in the Roman Mediterranean Sea: Black dots are main hubs: Rome, Alexandria, Carthage, Gades; Red dots are regional hubs. In addition to the four main hubs, the above survey of Roman imports provides a series of ‘regional hubs’, including Carthago Nova, Tarraco, Narbo, Arelate, Puteoli, Syracusa, Aquileia, Athens, Byzantium, Tomis, Crimea, the Tanaïs river area, Nicomedia, Ephesus, Rhodes, Attaleia, Cyprus, Antioch ad Orontem/Seleucia Pieria, Gaza (if it was more than a place of transit such as Myos Hormos and Berenike), Appolonia of Cyrene, Caesarea Mauretania, Lixus. In addition to Indian places such as Muziris (Pattanam, north of Cochin), a lesser known place such as Omana (possibly located at al-Dur, ed-Dur, in Umm al-Quwain Emirate) should be mentioned here too in order not to under-estimate ancient traffic in the Gulf to Palmyra and Antioch. A pattern of imbricated networks could be refined almost indefinitely as each regional hub may have its own trade with its hinterland and other nearby smaller ports. Like a fractal that exhibits a repeating pattern displayed at every scale. Sailing from cape to cape (cabotage) is the most obvious route for any seafarer, except for those sailing a direct route on offshore waters. DUCRUET, C., (2015), “Inside the pond: an analysis of Northeast Asia’s long-term maritime dynamics”, International Journal of Maritime Affairs and Fisheries, Korea Maritime Institute, 2015, 7 (2), pp.25-40. ARNAUD, P., (2015c), “ La batellerie de fret nilotique d’après la documentation papyrologique (300 avant J.-C.-400 après J.-C.) ”, in La batellerie égyptienne, Archéologie, histoire, ethnographie, éd. P. Pomey, Centre d’Etudes Alexandrines, 34 – 2015.: Kerkouros-type ships were sailing and rowing southward on the Nile in winter time, at least during the Hellenistic period. BRAUDEL, F., (1949), “La Méditerranée et le monde méditerranéen à l’époque de Philippe II”, éd. Armand Colin, Paris, (533 p) : he distinguishes various basins: “La Méditerranée n’est pas une mer, mais une succession de plaines liquides communiquant entre elles par des portes plus ou moins larges.” Each basin is the result of human cultures superimposed upon physical constraints, with continuous changes always going on. and: STONE, D., (2014), “Africa in the Roman Empire: Connectivity, the Economy and Artificial Port Structures”, American Journal of Archaeology, 118(4), (p 565-600). Tarraco may have been the exporting place for metals from the north-western Tarraconensis (Galicia). Narbo may have been a place of transit of metals from Great Britain sailing to Burdigala. Arelate may have been a place of transit for goods originating in northern Europe. Byzantion and Nicomedia were both ancient Greek cities, but they were on each side of the Bosphorus, on different continents: Thracia on the western side, was rather undeveloped, and Asia Minor on the southern side, was highly developed since many centuries. Nicomedia was a major Roman city in the 2nd and 3rd c. AD, while Byzantium was reconstructing after Septimus Severus’ destructions in 195 AD and finally heading for becoming a capital city when renamed Constantinopolis as late as 330 AD. Pergé was part of the Roman Empire since 188 BC and was the capital city of Pamphylia. It had its own river port some 16 km from the sea, but the seaport of Attaleia could be used when the coast was free of pirates. RICE, C., (2016), “Shipwreck cargoes in the western Mediterranean and the organization of Roman maritime trade”, Journal of Roman Archaeology, 29. RICE, C., (2011), “Ceramic assemblages and ports”, in Maritime Archaeology and Ancient Trade in the Mediterranean, edt. D. Robinson & A. Wilson, Oxford Centre for Maritime Archaeology Monographs. une approche méthodologique”, in: Rome, Portus and the Mediterranean, edt. S. Keay, British School at Rome, Oxbow Books.